Cam Newton was the Panthers' first ever first-overall selection (2011), and went on to win the AP Offensive Rookie of the Year award. The Carolina Panthers joined the National Football League (NFL) in 1995 as the league's 29th franchise. Their first ever selection was Kerry Collins, a quarterback from Penn State, in the 1995 NFL Draft. The team's most-recent first-round selection was Vernon Butler, a defensive tackle from Louisiana Tech, in the 2016 NFL Draft. Every year during April, each NFL franchise seeks to add new players to its roster through a collegiate draft officially known as "the NFL Annual Player Selection Meeting" but more commonly known as the NFL Draft. Teams are ranked in inverse order based on the previous season's record, with the worst record picking first, and the second worst picking second and so on. The two exceptions to this order are made for teams that appeared in the previous Super Bowl; the Super Bowl champion always picks 32nd, and the Super Bowl loser always picks 31st. Teams have the option of trading away their picks to other teams for different picks, players, cash, or a combination thereof. Thus, it is not uncommon for a team's actual draft pick to differ from their assigned draft pick, or for a team to have extra or no draft picks in any round due to these trades. The Panthers' only first overall selection came in 2011, when they selected Newton. They would have picked first in 2002, however, the inception of the Houston Texans that year allowed Houston to pick first instead of Carolina. Carolina had the first overall pick in their inaugural season, but traded the pick to the Bengals for the 5th and 36th overall selection. The Panthers have twice selected a Miami Hurricanes player in the first round: linebacker Dan Morgan in 2001 and Beason in 2007. Collins, the team's first ever selection, made the Pro Bowl and led the Panthers to the playoffs in only their second season of existence, but he was later released after struggling on and off the field with alcoholism. Rae Carruth began his career as a promising wide receiver, but he was dropped from the team after being arrested for hiring someone to kill his pregnant girlfriend (he would later be convicted of the crime). Julius Peppers won Rookie of the Year, was named to the Pro Bowl on several occasions, and was the centerpiece of the Panthers' defensive line until signing with the Chicago Bears. 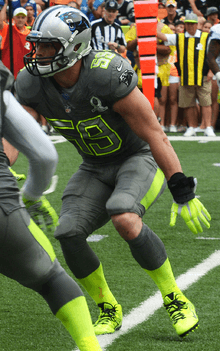 Dan Morgan was also a highly touted Pro Bowl linebacker, but repeated concussions had caused him to miss parts of several seasons until the Panthers released him in 2008. The Panthers drafted Jon Beason in 2007 partially to insure their defense against Morgan's absence. Newton threw for 422 yards in his debut game, an NFL record, went on to set several passing records as a rookie, and won the AP Offensive Rookie of the Year award. Kuechly led the NFL in tackles his rookie year, and won the AP Defensive Rookie of the Year award one year after Newton's offensive ROTY. When the Panthers and Jacksonville Jaguars joined the league together in 1995, both teams participated in an expansion draft, where they selected players from 30 existing NFL teams. This list does not include players selected in that draft. 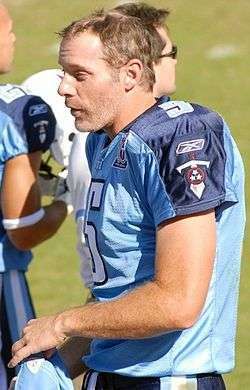 Kerry Collins, shown here as a member of the Tennessee Titans, was the Panthers' first ever first-round draft pick, and went to the Pro Bowl. Julius Peppers was selected second overall in 2002, and was named to four All-Pro teams. Luke Kuechly was drafted ninth overall from Boston College, and won the AP Defensive Rookie of the Year award in 2012. ↑ The Panthers acquired this pack from the Bengals in exchange for the fifth and 36th picks. ↑ The Panthers traded their 1999 and 2000 first round picks to Washington for defensive end Sean Gilbert. ↑ The Panthers acquired this pick from Miami in exchange for their 1998 2nd-round pick (44th overall, used to select Patrick Surtain); the Panthers' original first-round selection had been traded to Washington. ↑ Although the Panthers finished the previous season with a league-worst 1-15 record, the first overall pick was awarded to an expansion team, the Houston Texans. ↑ The Panthers acquired this pick, a second-round (59th overall, used to select Ryan Kalil) and fifth-round (164th overall), used to select Tim Shaw selections from the New York Jets in exchange for the Panthers' first-round (14th overall, used to select Darrelle Revis) and sixth-round (191st overall, later traded to Green Bay, used to select Korey Hall) picks. ↑ The Panthers acquired this pick from the Eagles in exchange for their 2008 2nd (43rd overall) and 4th (109th overall) round picks, as well as their 2009 1st round pick. ↑ The Panthers traded their 2010 first-round pick to the San Francisco 49ers in exchange for their 2009 second and fourth-round selections (43rd and 111th overall, respectively). ↑ "History". Panthers.com. Archived from the original on 2007-04-29. Retrieved 2007-05-28. ↑ Alder, James. "NFL Draft Basics:Determining Order of Selection". About.com. Retrieved 2007-12-01. ↑ "He played a remarkable rookie season...", "He was "a fast receiver who could catch and had big-play potential," said Hurney." "Panther back office testifies for Carruth". CourtTV.com. 2000-12-14. Retrieved 2007-06-01. ↑ "On a defensive line that suddenly has emerged as one of the league's best young units... Peppers is the linchpin." Len Pasquarelli (2003-08-05). "Peppers has bulked up, improved footwork". ESPN.com. Retrieved 2009-03-12. ↑ "Beason gives the Panthers the comfort they need at linebacker, where they can't help but be nervous about Dan Morgan's repeated problems with concussions." "What they're saying". Panthers.com. Archived from the original on 2007-05-01. Retrieved 2007-05-29. ↑ "Carolina Panthers vs. Arizona Cardinals recap - September 11, 2011". ESPN. 2011-09-11. Retrieved 2013-07-15. ↑ Barry Wilner (2012-02-04). "Cam Newton wins Offensive Rookie of the Year". Huffington Post. Retrieved 2013-07-15. ↑ Marc Sessler (2013-02-02). "Luke Kuechly wins Defensive Rookie of the Year honors". National Football League. Retrieved 2013-07-15. ↑ "Expansion Draft". Panthers.com. Archived from the original on 2007-09-27. Retrieved 2007-05-28. ↑ "Honors". Panthers.com. Retrieved January 17, 2014. "College Draft History". Panthers.com. Retrieved 2015-07-15.